Fibromyalgia Awareness | Information, Tips, Support, Patient Stories: What is Fibromyalgia? A chronic disorder characterized by widespread musculo-skeletal pain, fatigue and tenderness in localized areas. However, it is much more than just all-over-the-body all-the-time pain and hence it is considered as a syndrome. 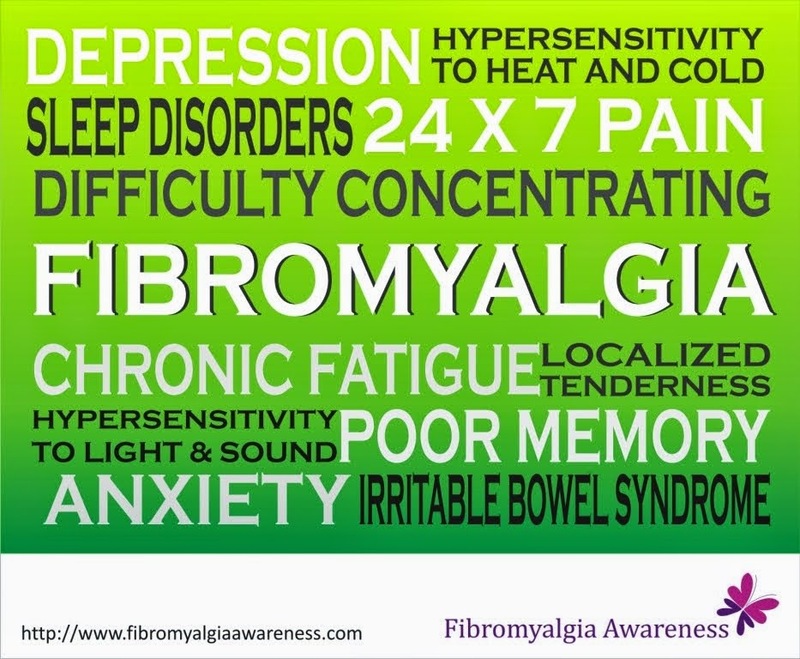 Fibromyalgia brings with it immense problems ranging from fibro fog (cognitive dysfunction, in simple terms problems with memory and concentration), stiffness, depression and anxiety to hypersensitivity to light, heat and sound, dryness in mouth, chronic fatigue, sleep disorders, bowel and bladder abnormalities, reduced ability to exercise... to name a ‘few’! If you have Fibromyalgia and find it tough to explain to people what exactly it is, this might help you - How to explain Fibromyalgia to people? Fibromyalgia is classified as a Central Nervous System condition. Simply put, fibromyalgia patients have a supersensitive Central Nervous System. Researchers associate it with an imbalance in brain chemicals called neurotransmitters. The neurotransmitters that send information from the body to the brain become overexcited (central sensitization). Hence, a tap on the shoulder might feel like a blow to an FM patient. 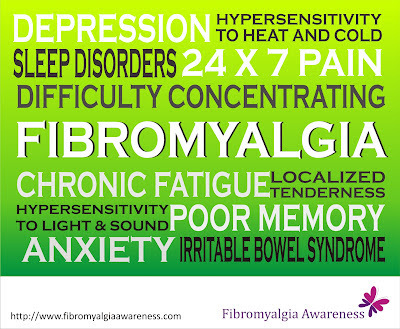 People with Fibromyalgia experience pain in at least 11 of the 18 tender points shown in this image. Fibromyalgia is often termed as Invisible Illness as patients do not generally look sick. What’s more traumatic than the condition itself is that fibromyalgia patients find it tough making those around them understand what they are going through. Lack of general awareness about the condition adds to the stress which actually should be avoided when a person has Fibromyalgia. No one exactly know what causes Fibromyalgia. Research and studies on Fibromyalgia are in progress. Some experts believe it is linked to stress, trauma and illness. There is no established prevention method. This is very brave of you, talking about your illness and spreading awareness. You are doing a big pay-back to the community. @Capt TR - Sorry for the delayed response. You tips will be helpful to many! Thank you! NS - Thanks for the comments and encouraging words! I recently read an article stating that the cause of Fibromyalgia has been found; apparently it's due to an overload of blood cells in the hand. Sound extremely strange (and even unlikely) but if it's true, I hope they use this to find a cure. My FMS gets worse by the day. where did you read/find this information? i was diagnosed with fibro about 2 years ago.i also have spinal stenosis which also causes me pain.i have a frozen shoulder,copd and extremely tight piniformis and gluteal muscles in my backside which causes pain also.i am being treated at the moment by a chiropractor to trt to relax these muscles,so I cannot tell at the moment if its fibro or not because of all the other pain im in.